This doesn't even require a build up; this awesome poster should be enough, however I can't contain my glee. What a package deal! It's like the 90's, when flannel ruled, but with free hot dogs, knife throwing, and more musk. Birds Barbershop and my favorite social coordinators, John Gross and Luther Himes of Party Ends, are teaming up for this afternoon Man Fest. 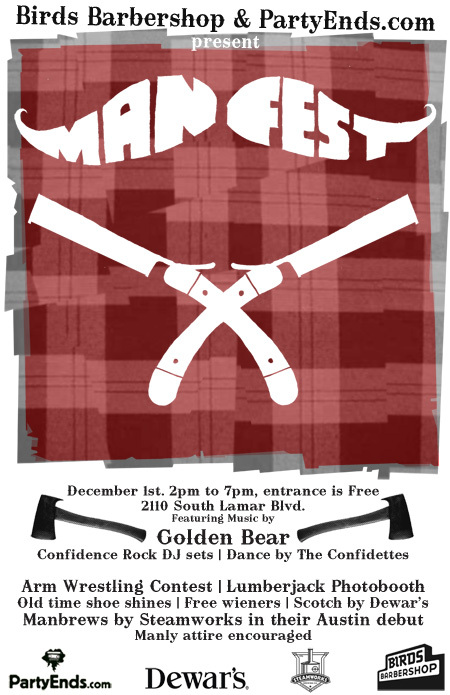 The rugged shindig kicks off at 2pm, Saturday, Dec. 1st. And did I mention, it's FREE. I'll be the girl staring at all the facial hair, afraid to arm wrestle, but singing the words to "Winner Takes it All". See you there.